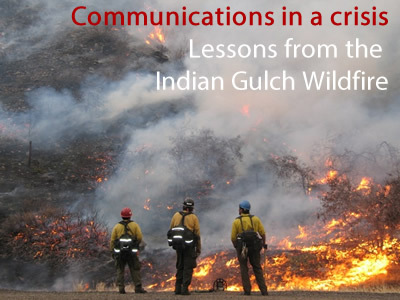 A few weeks ago, Jacob and Bill Fisher, a Golden City Council member, released a brief, highly readable report analyzing the lessons learned about communications (particularly digital/online networks) from the Indian Gulch fire. The report digs into early observations shared on the site Emergency Management in 2011. Since early-2011, Colorado and other states have endured dozens of major wildfires. Last week, much of Colorado received torrential rains that caused flooding across 4,500 square miles (an area the size of Connecticut). Nearly 20,000 homes have been destroyed or damaged. Clear, informative, timely communications in crisis events is critical. The report released by Jacob and Bill Fisher provides useful takeaways summarized below. I think that campaign and organizational leaders can learn from these as well. After all, advocacy and political campaigns often endure similar crisis events and must always be aware of the constant news cycle. The conventional means of staying tuned in – TV, radio, and print media plus their web sites – were useful and helpful, and for some people they seemed to work well. But many people were really hungry for information (especially those whose homes were at risk), and communication on the conventional channels was too infrequent and incomplete to meet their needs. This was especially true for the folks who had been issued an evacuation warning preceded by an erroneous evacuation order. People wanted to be in the loop. Ongoing communications via the mayor and council member’s unofficial/personal web, email and social media channels were valued by residents. These accounts, especially social media, made it possible for city leaders to respond to individual questions. Jacob, Bill Fisher and other leaders were moving across the region, observing fire impacts, talking with residents and emergency responders. They had a scope and volume of information that residents needed but could not get. Sharing this information helped residents manage their homes and personal lives. Many emergency personnel also appreciated the information they were able to share about what was happening across the region. Circulating through the community, sifting through information and relaying knowledge across various channels became a full-time job. Jacob notes that they could have saved time by simply relaying official notices to their network but that would not have been as valuable to residents. Getting people valuable information takes time. The mayor and council member communications channels were not “official.” They could respond and update people more quickly than officials (e.g. Sheriff, the City of Golden, federal incident team firefighting leads) but struggled at times to ensure that their information was accurate. Today’s social networks mean that information is porous, especially during a crisis. Right or wrong, information will get out there. By being on the ground and participating, Jacob and Fisher could fact-check rumors (and themselves). Leaders need to think about how to better meet demands of accuracy and speed. Strong emergency response simply left more time for the mayor to gather and distribute information. A well-prepared team equals better communications. Most residents were getting information from just one or two sources. Those may include Twitter and Facebook, TV news stations, radio, email newsletters, the city website. But few could interact with a broad range of sources, limiting their scope of knowledge. Some channels were better than others at providing accurate information. We need to look at how to better integrate accurate information into multiple channels. Social media channels worked well because they were fast, transparent and widely used (or at least readily accessible). Social networks let people ask questions. Social media also allows for crowdsourced analysis and fact-checking. Twitter and Facebook gave Jacob and Fisher better awareness of the information gaps they needed to close. Many people aren’t using social networks or can’t access them continually throughout the day. Jacob sent a highly informative daily summary to his email list. One key point: it would have been very difficult to build an email list after the fire started. The value of email was based largely on the list already being in place. During a crisis probably isn’t the best time to build a social media strategy. Social network participants amplified the information flow on Facebook and Twitter. Tweets were retweeted, blog post links were shared, email newsletters were forwarded, and so on. This dynamic has risks: Jacob and Fisher felt a need need to stay plugged in to catch any inaccurate information or growing rumors. On the other hand, key information about the fire, evacuation alerts, and so on was more readily available beyond immediate social networks because of the amplification. Responding quickly to questions by email, social media, and phone was also an important part of addressing anxiety and uncertainty among community members. Jacob and Fisher were joined by the city and county efforts to ramp up their own nontraditional communications. The scope of social, email, print, web, TV, and other communications channels is too great to go it alone. Primary Recommendation: the City of Golden and other local governments must find ways to vet and share information more quickly while simultaneously supporting credible voices in the community (e.g., the mayor and city councilors), especially those with strong communications networks (e.g., email newsletters and Facebook followers). During non-crisis periods, municipalities should continue working to develop increased outreach opportunities with citizens.